In the days leading up to landfall, satellite imagery from GOES-16 and multiple recon missions by the NHC's Hurricane Hunters became crucial pieces of data for monitoring Harvey's strength and movement. Going from an unorganized area of convection to developing a solid eye-wall, Harvey thoroughly tapped into the untouched warm Gulf of Mexico waters, which fueled its rapid intensification. 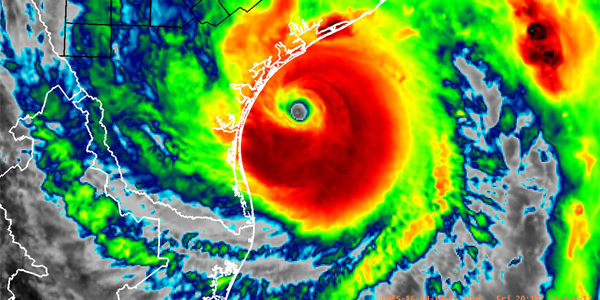 At times during its new life as a hurricane, the central pressure dropped over 1 millibar per hour only adding to the distress along the Texas coastline. The Texas governor, Greg Abbott, and many local mayors in Harvey's path took to the media with warnings of Harvey's potentially devastating impacts. Many counties and regions within the Lone Star state were issued voluntary and mandatory evacuations as the governor declared a state of emergency. 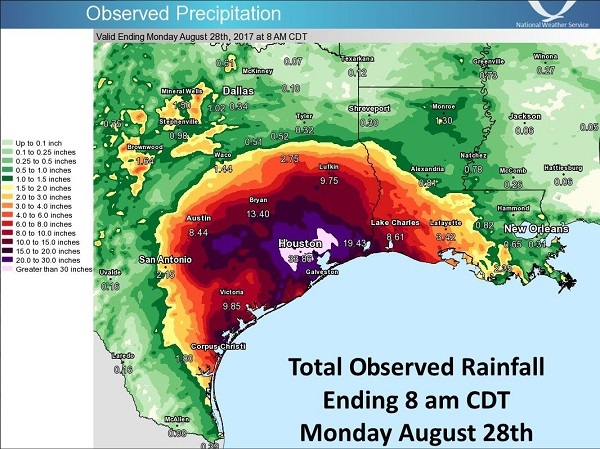 Weather forecasts were talking about historic rainfall totals up to 30 inches and strong Category 3 winds of 120 mph, but with little to hold it back, Harvey had the potential to strengthen further. At 10PM CDT on August 25th, Harvey made landfall near Rockport, TX as a Category 4 hurricane with a central pressure of 938mb, packing sustained winds just over 130mph. These winds devastated areas between Port Aransas and Port O'Connor, which took a direct impact from the eye wall. 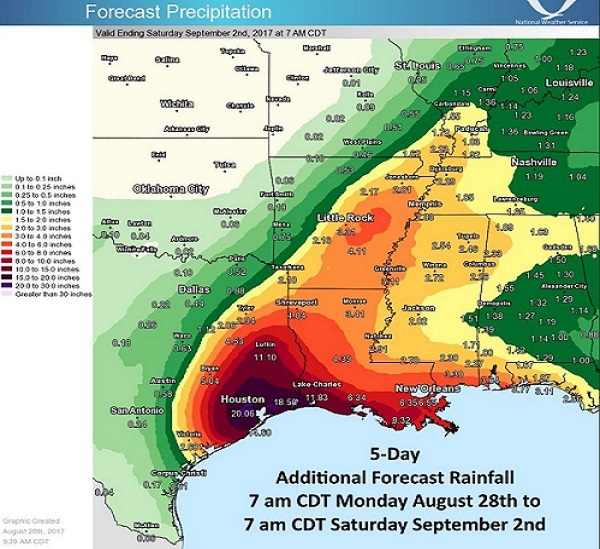 Areas from Corpus Christi, TX to Lake Charles, LA have already received copious rainfall of 10 - 20 inches, but the cities of Galveston and Houston have been hardest hit so far with 30 - 40 inches of rainfall and over a foot of additional rainfall still expected. President Trump recently signed a Disaster Proclamation to help support the flood stricken areas as state police and the Red Cross call for volunteers to offer additional help. The Cajun Navy, a group of locals from Louisiana who earned their heroism during Hurricane Katrina in 2005, have already sent hundreds of their own to help rescue stranded people that cannot get out of Harvey's path. Parts of Texas are unrecognizable from the combination of hurricane force winds and the inundation of high waters, which have made interstates and evacuation routes impassable. The entire Texas National Guard was even activated, sending 12,000 troops to help rescue and recovery efforts in hopes to minimize to potential loss of life as people remain stranded in their homes and on building rooftops. While areas in Texas and Louisiana are still battling bands of heavy rain and rising flood waters, Harvey has produced a dozen of short-lived tornadoes in its path and has already cost billions of dollars in damage. Even though Harvey has weakened significantly from its August 25th landfall, the tropical storm has recently shown signs of strengthening as it is reentering warm Gulf waters and will unfortunately make a secondary landfall near Galvaston and push deeper into eastern TX and Louisiana. With its current track, it could take until Friday before lingering moisture from the storm fully exits the state. With every natural disaster, there are thousands that want to offer some form of help. Volunteers from the Northeast US have taken the long trip down to assist with Red Cross shelters or just to help strangers in need. Even after the remnants of Harvey push northward and sunshine returns to the Lone Star state, the cleanup process will just be getting underway. For months and years to come, many of us will look back at Harvey as a reminder of Mother Nature's potential. While for many in Texas, the loss of life and the destruction of their home will loom in the back of their minds forever. The Red Cross is always asking for help and donations (www.redcross.org or 1-800-RED-CROSS). Who knows, one day the stranger you help in need may be your savior when the next natural disaster hits.